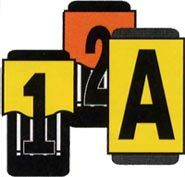 Solid black polypropylene characters are permanently embedded in the bright yellow, orange or white polypropylene substrate. Size 1: 0.08" Thick - Size: 0.7" x 1.7"
Size 2: 0.08" Thick - Size: 1.7" x 7"
Size 3: 0.08" Thick - Size: 2.6" x 1.7"
Size 4: 0.08" Thick - Size: 3 1/2" x 2 1/2"
© 2014 TEK I.D. All rights reserved.